The best place to start your organization efforts is to establish a garage workbench zone. Since this zone will become a semi-permanent location, you want to study the traffic pattern in your own garage and establish the zone in an area that will least interfere with human traffic movement from the cars to the door between your home and garage. The workbench zone is a key part of your overall garage storage and garage organization ideas planning, so give it just consideration. The Garage Workbench Plan shown at the left shows our previous plan for a 24' x 24' - 2 car garage from our Garage Storage page with all other proposed storage solutions removed from view so we can focus-in on just the workbench zone and small tool storage that accompanies it. The workbench zone is the blue shaded area and the workbench itself is shaded in beige. The garage workbench zone in this size garage is 16 feet in length. That is a comfortable length that does not interfere with the human traffic near the man-door. The garage workbench itself can be placed anywhere within this 16' long zone, so the position shown on this plan is not fixed. You could place the workbench up against the far wall to the right of it, or you could place it dead center in the zone. It really depends on what you would like to place on either side of it in the remaining portion of the zone, such as locking garage storage cabinets for special tools, or wall mounted tools such as a grinder for sharpening tools, etc. 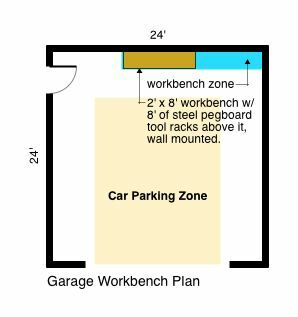 Since the garage workbench will be heavy it is important to get this workbench zone located in the best spot for your garage early in your garage storage and garage organization ideas planning. Plus, there will be fixed pegboard tool racks above the workbench, so it is not a good candidate for frequent moving if you want to keep everything organized. 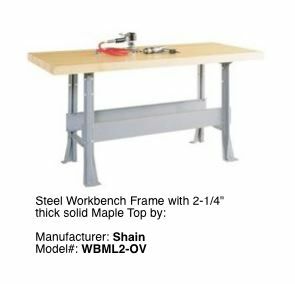 The Shain Workbench shown at the right is 64" in length, 33.25" high and 28" deep from front to back. It is made of steel and finished in gray and has a 2-1/4" thick solid Maple top. The steel frame is heavy gauge. It is ideal for potting plants or heavy machine work such as small engine repair or home woodworking projects. You can use a workbench up to 8' in length as is shown in the Garage Workbench Plan above — the size or length is determined by your situation and should be decided upon during your garage storage and garage organization ideas planning stage. Next you will need to consider small tool storage and access above your workbench. 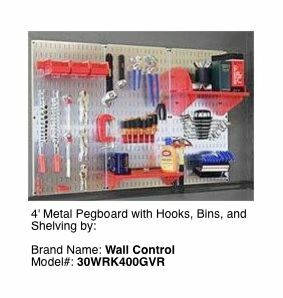 This can be 1/4" composite pegboard sitting on 1 x 2s firmly attached to the wall studs or something more durable like the unit shown below that is galvanized steel that comes in five-colors and plain galvanized finish. This unit is easy to install as it comes in three (3) 16" wide x 32" tall sections. One unit, after installation, covers a 48" wide area that is 32" high. If you have a lot of tools to control and access, use two (2) of these units for a full 8 feet in width. 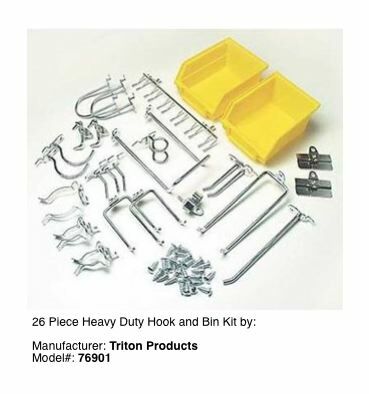 These units come with the shelves and hooks shown in the photo (tools and tool-sets not included). If you decide to use 1/4" thick composite pegboard as mentioned above, you can get some excellent hook-and-storage kits like the one shown below that snap right into standard pegboard holes. This unit is a 26 piece kit and the trays can be lifted right off of their supports for easy access to their content. These units are inexpensive and provide great heavy-tool support for saws, sanders, etc. They are a fantastic garage storage concept item. Now that you have the general idea about how to establish your workbench zone you can start planning the location in your own garage. Give some strong consideration to lighting your work surface and tools as shown in the garage lighting plan as you layout your own workbench zone. Good lighting makes for safer projects and is a big part of garage organization ideas planning. Once you have the workbench location laid out for your garage, then move on to studying how to get garage wall shelving worked into your overall plan for those items that clutter the floor, yet need to be accessed on a frequent basis.